Guardians of the Galaxy opened to huge box office numbers over the weekend, racking up $94.3 million dollars and setting a U.S. record for an August film release. Tim and Anthony talk about the film's success, where it ranks in the Marvel Cinematic Universe, and the movie's uber nerd director James Gunn. Alice in Wonderland: Through the Looking Glass has began principal photography in England with most of the cast from Tim Burton's Alice in Wonderland (Johnny Depp, Anne Hathaway, Mia Wasikowska, Helena Bonham Carter and Alan Rickman) intact. This is not thrilling news given Tim and Anthony's dislike of Burton's film. Still it's encouraging that James Bobin (The Muppets, Muppets Most Wanted) will direct and will almost certainly give the sequel a lighter touch than its predecessor. 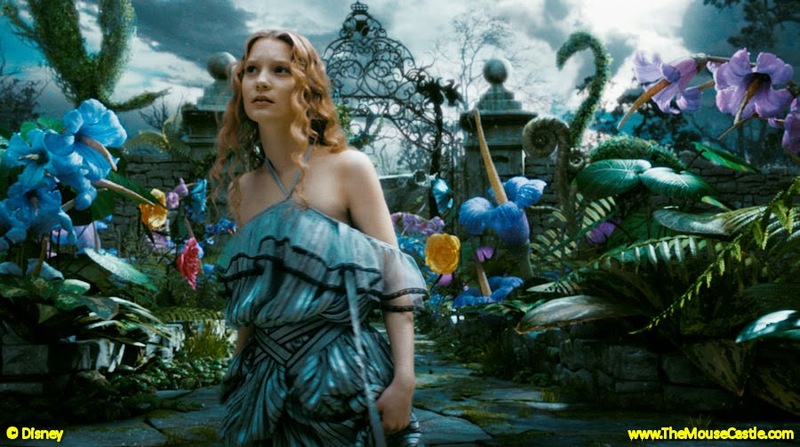 Mia Wasikowska as Alice in Tim Burton's Alice in Wonderland. Bill Murray will voice Baloo in Disney's reboot of The Jungle Book, slated for release on October 9, 2015. No word on if he'll croon The Bare Necessities as a cheesy lounge singer. Frozen co-director Jennifer Lee is penning a script for Disney based on Madeleine L'Engle's famed children's book A Wrinkle in Time. It was one of Lee's favorite stories growing up. The Muppets are back in a series of short comedic vignettes, Disney Drive-On with The Muppets. In episodes available only on www.DisneyMoviesAnywhere.com, Kermit the Frog assigns Pepe the King Prawn to mentor Walter on the ins and outs Disney Studio activity. On the way, they encounter celebrities like Martin Landau and Jennifer Tilly. Yeah, we think it's cute too. Gravity Falls is back (finally) for a second season on Disney Channel and Disney XD. Tim waxes poetic about the animated denizens of the strange Oregon town and pines for the voice of Mabel Pines, Kristen Schaal. A seven-minute preview of Star Wars: Rebels is online now. Time to tear to shreds the animated series Anthony calls "Aladdin in Space." Walt Disney was known to enjoy a drink of scotch or two during his life. How this plays into Walt being portrayed in an episode of Comedy Central's Drunk History remains to be seen. You can catch the episode which stars Jack Black, John Lithgow, Nick Kroll, Tony Hale, and Lindsay Sloane tonight (8/5) on Comedy Central.